New York’s JFK Airport is poised for a $132m investment to revive its flagging cargo business, after the governor of New York state gave his blessing to schemes to modernise freight facilities and improve aircraft access. Under an agreement between Port Authority of New York & New Jersey and cargo property developer Aeroterm, two old warehouses at the airport will be demolished to be replaced by a modern, 346,000 sq ft cargo terminal in a $70m project. Aeroterm is taking a 33-year lease on the site, which will be occupied by Worldwide Flight Services and its airline tenants. A second development, with a $62m price tag, will “broaden, rehabilitate and realign” two taxiways to allow large freighter aircraft to access the cargo area. The green light from the state capital follows an announcement from the port authority in September of a $215m spend on repairs to a major runway and the construction of a high-speed taxiway at the airport. According to the state government, the developments are part of a broad move to overhaul JFK’s crumbling cargo infrastructure. A number of warehouses, built 40-50 years ago, are vacant and unsuitable for modern requirements. As much as half of the existing infrastructure is below current international standards. 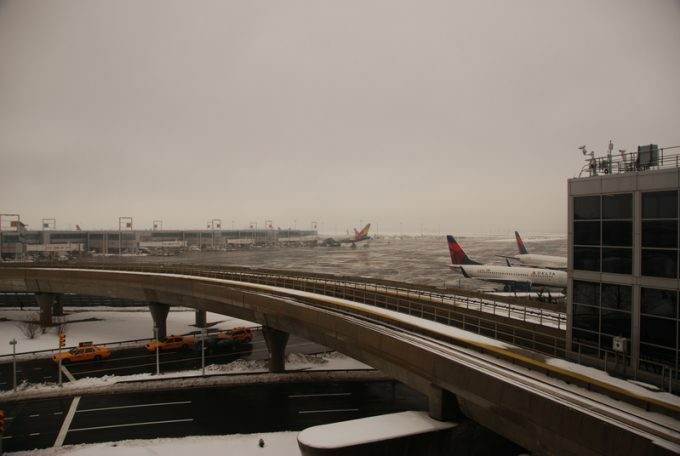 The port authority intends to phase out the obsolete and underused facilities and consolidate cargo activities on the north side of the airport. Shawn McWhorter, president for the Americas at Nippon Cargo Airlines (NCA), said modern facilities were needed, but stressed that ramp space was also an issue. “We have limited space when we park our 747-8 on the ramp,” he said. NCA moved its US headquarters from JFK to Chicago and sold its cargo terminal to American Airlines, but it still runs three flights a week to New York. Mr McWhorter emphasised the need for a strategy beyond the establishment of modern facilities. “If you put a little oasis in the middle of the airport that you can’t get to, that’s of little help,” he said. Probably more than by outdated and fragmented facilities, cargo traffic has been bugged by access problems. For trucks, the only viable highway corridor to the airport is the notoriously congested van Wyck Expressway. “You pay the toll, cross the bridge and lose a couple of hours on the van Wyck,” said Elio Levy, executive vice-president of forwarder Logfret. “We tried to use Newark instead. It makes sense, because a lot of freight goes west, but a lot of airlines still fly to JFK,” he continued, adding that charges at Newark were higher. Much of the freight landing at JFK is moved through container freight stations off-airport, Mr Levy noted, but this still forces trucks to use the van Wyck artery to New York city or the highways on the west side. And the small roads around the airport are another challenge; tough for 53ft trucks to navigate. Over the years JFK has been the one major US gateway that has lost ground, while Chicago, Los Angeles, Miami, Atlanta and Dallas/Ft Worth continued to draw in cargo, to the detriment of second-tier airports. However, this year the New York gateway’s throughput is on the rise again. In the first half of the year it recorded a 6.7% rise in tonnage, driven by an 8% gain in international volumes, while domestic cargo advanced 1%. Panalpina also moved its administration centre out of JFK a few years ago, but kept operations there. The port authority has worked hard to boost JFK’s cargo activities. In February, the airport’s ‘Ark’, a $65m animal facility with 178,000 sq ft of warehouse space, came onstream. Pets account for a significant chunk of the facility’s traffic, but it also targets horses, birds and livestock. For NCA, equine traffic – mostly racehorses from Kentucky – continues to fly out of Chicago, although this was per customer requests, Mr McWhorter said.